If the bees get their act together it will be a bumper blueberry crop. There have never been as many flowers on the blueberry bush. I missed last year's crop as it ripened while I was still in Cape Town. But the Frenchman collected them all and froze them for me. They were gorgeous. There is less sun here than on the Brooklyn rooftop by about six hours (only around four hours direct, here, where it was all-day, there), but blueberries are forgiving. But how forgiving? The blueberry has a friend, a taller, skinnier version (I pruned this one quite hard after fruiting) that I picked up at Union Square for $26. A very good price. The same nursery had one-quart perennials, two for $10. Almost too good to be true. The first harvest. 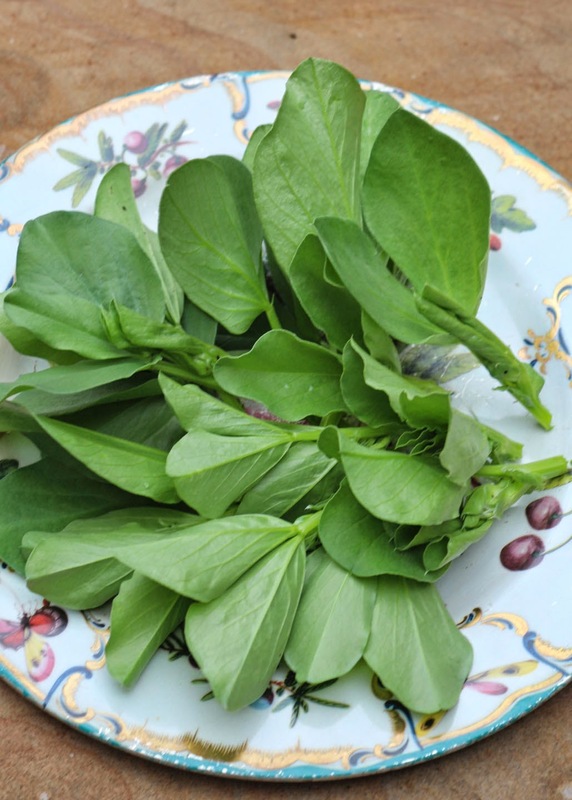 Fava bean leaves. I picked just the tops off the plants. They were wilted in last night's soy-dressed noodles. The Frenchman managed to taste them before my roasted chile sauce blew off the top of his head. I planted a blueberry bush for the first time this season. I can't wait to see how well it does! My bb survived the awful winter and bloomed well - many tiny berries starting - if only i can get them before the birds! 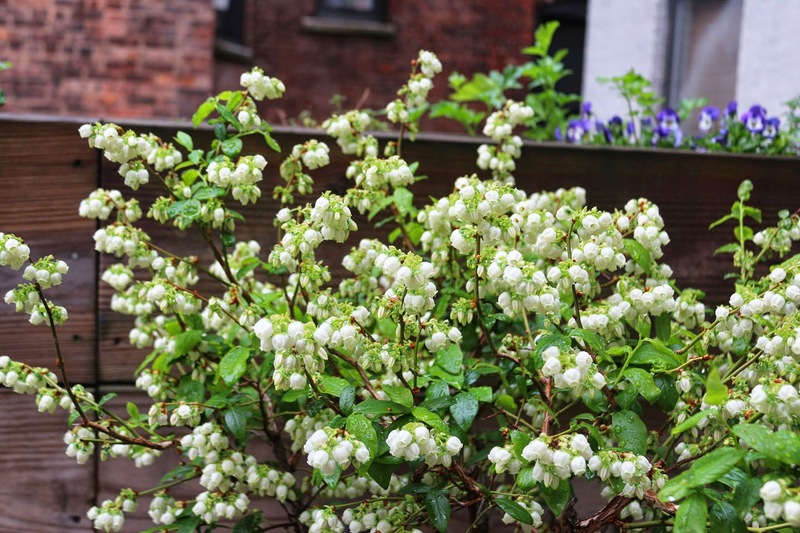 Do you add any compost or organic fertilizer to your blueberry bush? I give it Espoma granular Rose Food (!) about 3 times a year - early spring, in about a week, and then after I have pruned (after fruiting). And I give it a mulch of fresh coffee grounds, and occasional drinks of actual coffee. I had many friends tell me to plant another blueberry bush to increase pollination. Do you find any problems with having only one plant on your terrace with fruiting?